What lies beneath your skin? At Navanah skin and beauty we are all about results. We love skin and want to help our clients treat and maintain healthy radiant skin for life. Our “skin transformation” success stories are what makes us so passionate about our work and the way all of these stories begin is with a comprehensive, accurate skin consultation. The future in skin diagnostic technology has arrived at Navanah skin and beauty. The OBSERV skin scanner is the future in skin diagnostic technology. 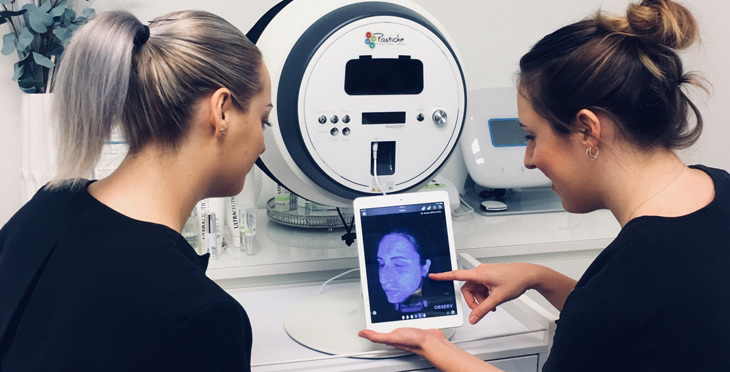 It provides us with an in depth look at what is happening in the deeper layers of the skin allowing us to instantly & accurately diagnose skin conditions beneath the surface & at the same time gives us an insight into what the future forecast of your skin is likely to be. This fantastic diagnostic tool shines different light modes onto your skin, enabling your therapist to diagnose skin conditions that may not be visible to the naked eye. There are five different skin analysis modes including daylight, woods lamp and true UV illumination. The pictures produced by the OBSERV help us to identify irregularities of structure, skin texture and skin tone. The real benefit of the OBSERV is that by taking accurate clinical photographs at the start of a treatment plan, we can continuously monitor progress. This means we have an accurate visual record of your before and after results! And results are what we are all about!! At Navanah skin and beauty we offer a comprehensive skin consultation, a bespoke treatment plan that is designed for you based on both your skin concerns and a technical analysis from the OBSERV, a skin prescription and most importantly lots of support. Your therapist will be here each and every step of your skin journey! Each time you come in to the clinic we will reassess your skin with the OBSERV so you can see the results from your treatment and make alterations to treatment plans or at home care if necessary. Skin Consultations are $50. Fully redeemable same day of a product purchase or facial treatment. Confused about how much skin care to use?What are Skin Peels all about? What are Skin Peels all about? Confused about how much skin care to use?